German dermatologist, medical writer, and professor of medicine at the University of Berlin; born at Neu-Stettin, Prussia, Jan. 10, 1847. He attended the gymnasium of his native town and the University of Berlin, obtaining his doctorate in 1870. During the Franco-German war he was assistant physician at the Reserve Lazareth in Berlin, in which city he established himself as a physician in 1872, becoming a well-known specialist in dermatology and syphilis. In 1882 he was admitted to the medical faculty of the University of Berlin as privat-docent, and lectured on dermatology and syphilis. He also treated of the subject of prostitution. He became titular professor in 1897, and chief physician of the Municipal Dispensary for Sexual Diseases in 1891. 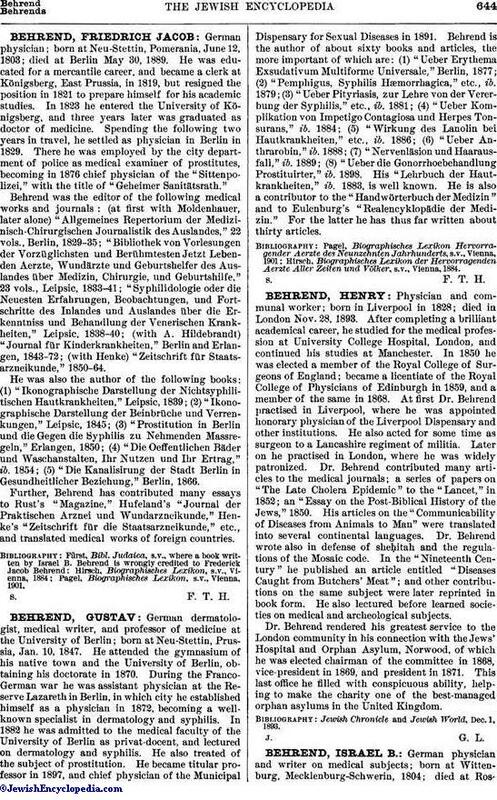 Behrend is the author of about sixty books and articles, the more important of which are: (1) "Ueber Erythema Exsudativum Multiforme Universale," Berlin, 1877; (2) "Pemphigus, Syphilis Hæmorrhagica," etc., ib. 1879; (3) "Ueber Pityriasis, zur Lehre von der Vererbung der Syphilis," etc., ib. 1881; (4) "Ueber Komplikation von Impetigo Contagiosa und Herpes Tonsurans," ib. 1884; (5) "Wirkung des Lanolin bei Hautkrankheiten," etc., ib. 1886; (6) "Ueber Anthrarobin," ib. 1888; (7) "Nervenläsion und Haarausfall," ib. 1889; (8) "Ueber die Gonorrhoebehandlung Prostituirter," ib. 1898. His "Lehrbuch der Hautkrankheiten," ib. 1883, is well known. He is also a contributor to the "Handwörterbuch der Medizin" and to Eulenburg's "Realencyklopädie der Medizin." For the latter he has thus far written about thirty articles. Hirsch, Biographisches Lexikon der Hervorragenden Aerzte Aller Zeiten und Völker, s.v., Vienna, 1884.